Crowdsourcing and refining ideas into reality – setting up an ideas site where anyone can submit an idea that represents the implementation of pre-defined shared values, and allowing people to upvote their favorites so everyone knows where people share the most values. See how this is being applied as a program known as crowdsourced placemaking in several communities here: http://bit.ly/1aIgYeW This provides a common ground for people to work together. People are also crowdfunding their favorite, and most feasible ideas, like here. Gifting is more likely to happen from local business owners, via sponsoring local events, listening to and building relationships with their customers, and adding to the sense of community in the neighborhood, so people are supporting them. People are gifting their time and effort to not only define what they’d like their community to be, but helping demonstrate that through crowdsourced pop-up events, like the Better Block program: betterblock.org and Park(ing) Day: parkingday.org. Think of them as one-day Burning Man camps. People are supporting their own ‘Center Camps’ as neighborhood and city plazas and squares, hosting marketplaces and farmers markets that are a caravansary of commerce without commodity. They’re supporting local businesses over chains. 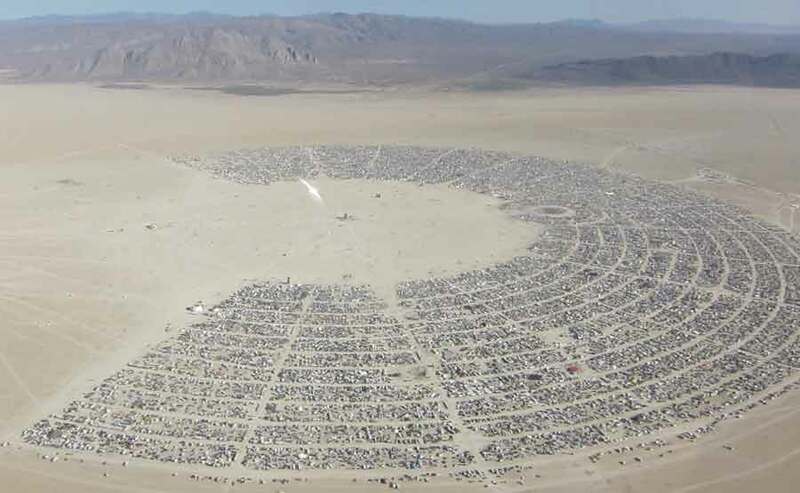 At Burning Man, people walk instead of drive, and talk to people face-to-face rather than watch TV or rely on your smartphone. People are developing/crowdsourcing ‘third places’ (your hang out outside of home and work) to connect physically, thus reducing the need, and desire to consume digitally. Developing/crowdsourcing places where it’s much easier to walk instead of drive. Supporting a community that uses renewable energy, and using less energy overall. Supporting farmers markets or even growing some of their own food. Relying on oneself and the people in their community to be the change they wish to see, especially locally, and crowdsourcing/crowdfunding that change with the people who share those values. Freespace in San Francisco, a pop-up creativity, community and civic innovation space, is a stage for radical self expression in a warehouse. Providing a forum where ideas can be shared with everyone (see crowdsourcing examples in Radical Inclusion), and then campaigned into being invested in and implemented. Promoting a program where people are supported to become entrepreneurs to transform their ideas into livelihoods and careers, as they’re doing with the Downtown Project in Vegas with entrepreneur grants, assistance, networking and coworking spaces. In Bristol, CT, the community, with the freedom to utilize crowdsourced placemaking to define whatever they wanted for their city’s downtown, chose a piazza: http://bristolrising.com/idea/a-piazza. Freespace, the creativity space in San Francisco, was the result of a communal effort, even crowdfunding its extended existence. Ciclovia, a weekly transformation of several miles of streets into pedestrian promenades and activities along the way, started in Colombia and inspiring events throughout world. Park(ing) Day and Carfree Day, annual events that allow residents to reclaim public spaces throughout U.S.
Crowdsourced placemaking programs are based on formal partnerships between residents, private sector investors and the local municipality. The Ciclovia events, from New York to San Francisco, are spearheaded by city officials, while those two city governments are also taking the lead in reclaiming traffic-congested streets and turning them into pedestrian plazas. The nonprofit Project for Public Spaces organizes such programs throughout the world. Any practice of sustainability, from green buildings to renewable energy to local reliance, is an application of the Leave No Trace principle. However, it’s the application of the other principles with Leave No Trace that begins to create a more collective impact, such as using communal effort, participation and radical self-reliance to build green neighborhoods like the Living City Block and One Planet Communities programs support. Cohousing is also another widely practiced form of communal Leave No Trace and sustainability, from the building to a small neighborhood scale. Just above every principle here generates a cadre of examples when combined with participation. What participation looks like is a gathering of people having a good time motivated by shared interests, which when done on a regular basis creates a sense of community. Our camp has a weekly ‘jam’ where some of us just make sure to show up every Thursday evening at a favorite ‘third place’. That single act of participation alone has elicited countless numbers of heartfelt hugs, stories shared and commitments to serve in the community. The Downtown Container Park in Vegas is one of the best examples of creating a vibrant downtown with immediacy, a downtown scene created in months what would normally take years. The pop-up movement is a common application of immediacy when it comes to placemaking, with overnight shops and even main streets popping up overnight, and often as demonstrations of what such permanent spaces could be. Immediacy is recognizing that positive change can be accelerated if you allow people to experience that change for just a little while, and realizing how great it could be. 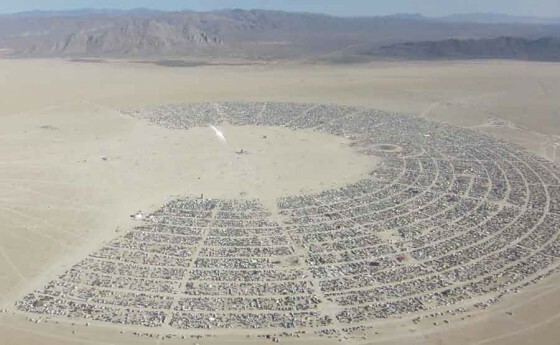 Burning Man itself is a grand example of immediacy for what the future of our cities could be. How do we actually do this in our own communities? If you’re looking for community-wide impact, it’s about taking a collective impact approach, as they’re doing with the Downtown Project and some of the crowdsourced placemaking initiatives. As you can see, many communities are applying individual principles in multiple ways, in multiple scopes.